The Lindy Hop (or Lindy) is a partner dance that originated in 1920's and 30's Harlem, New York. 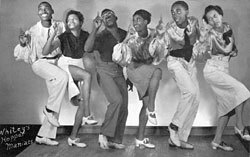 The Dance itself consists of both 8 and 6 count steps and it includes footwork influenced by Charleston, Black Bottom and Tap. The dance can be wild and spontaneous, with fast kicks and body movements, or it can be smooth and sophisticated. The most important aspects of it are that it is danced with your partner, to the music, and that you enjoy it! The Lindy Hop is considered a cultural phenomenon that broke through the race barrier when segregation was still the norm. 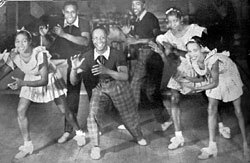 Although the lineage and history of Lindy may be muddled, it is certain that it was born from the blending of African rhythms and movements with European structured dance. The Lindy Hop has enjoyed a revival since the mid 1980's, when Swing Legend Frankie Manning, an influential choreographer and performer of the era, was rediscovered. Frankie was still teaching at age 94 and passed just weeks before his 95th birthday. Now the Lindy Hop and other Swing dances and variations are part of a world wide movement to get back on the dance floor. In New York City, ballrooms dominated Harlem, but one, The Savoy was to become the king of Swing. 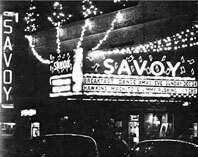 The Savoy was huge, taking up the whole block at 141st Street and Lenox Ave. Lindy flourished there, partly because it was one of the few racially integrated ballrooms where people of all ethnicities could dance, be inspired and shared moves like no other place. The Coat check could serve up to 5,000 patrons, and it needed to, with 70,000 patrons a year dancing at the "home of happy feet". The sprung floor was replaced every 3 years and came to be known as "the Track" due to its elongated shape. The bandstand at each end accommodated two live bands every night, 7 nights a week. Jazz was in its heyday, since a night out dancing was cheap, and recorded music was not yet readily accessible. Names such as Chick Webb, Cab Calloway, Duke Ellington, and Count Basie made music history in the battle of the bands held there. The players would feed off the dancer's improvisation as much as the dancers fed off the music. The atmosphere of the Ballroom must have been electric as the top dancers would meet in "Cats Corner" and take turns to show off and play with the rhythms. Weekly competitions promoted friendly rivalry between dance troupes and dancers were inspired to create new, more exciting moves to wow the crowd and win over the judges. Audiences were amazed to sight the first Aerial move (or airstep) created by Frankie Manning and his partner Freda Washington for these competitions. Dance Marathons were also popular, and it is during one of these that the Lindy apparently got its name. In 1927, Charles Lindbergh was daring the first ever solo flight from New York to Paris, and people were absorbed with his "Hop" across the Atlantic. A great dancer by the name of George "Shorty" Snowden was at the end of a long marathon when a reporter watching asked what this crazy dance was called. The quick witted answer was that it was the "Lindy Hop" and the name stuck. The Spectacular something was "Whitey's Lindy Hoppers". Herbert White or "Whitey", the head bouncer at the Savoy, was skilled at drawing together the best dancers from the Savoy to join his dance troupe. He arranged performances and competitions all over the country, and got his group into many films, such as "A Day at the Races" and "Hellzapoppin". The Lindy then had an audience across the Nation, by which it inspired and influenced other dance styles. And it is this film footage still amazes and inspires the dancers of today. "Lindy Hop" refers to this particular dance done to Swing music. The term "Swing" is now commonly used to include many styles of dance: Lindy Hop, Jitterbug, Balboa, Shag, East and West coast swing, Boogie Woogie, and has also inspired Jive, Rock and Roll, Ceroc, Le-Roc with regional differences in each dance family. Many may say that Lindy Hop was the granddaddy of them all, but that should not imply that no one was dancing any form of Swing before Lindy swept the country. People were already creating dances to their local bands. The variations in the music and the conditions they were dancing in impacted on the dance that was created in that region. Lindy Hop is pure joy, set to music!